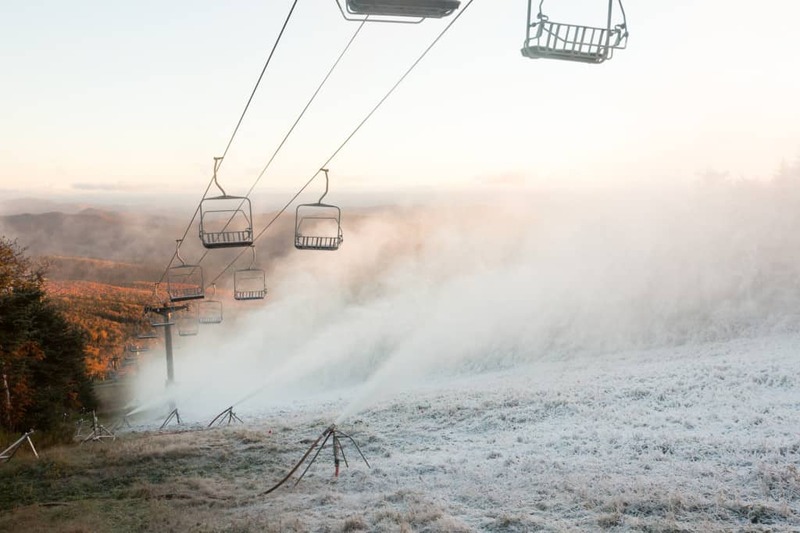 As they’ve done in the past, Killington Resort started what is consistently the longest season in the east on Oct. 25. An arsenal of 1,700 guns and 88 miles of snowmaking pipe blasted for 10 hours to layer the Rime and Reason trails—a total of 600 vertical feet—with five inches of the good stuff. Hats embroidered with “DAY ONE” were distributed and about 800 skiers and riders boarded the K1 gondola to the summit for a boardwalk for their runs. The K1 Express Gondola was also their way off the mountain as well. For Jon Kuehn, a Killington snowmaker with 17 years of experience under his helmet, it’s a sight he loves. Getting two trails open before Halloween is one thing, but preparing Killington’s centerpiece trails—the double-diamond Superstar—ready for a FIS World Cup race and the likes of Mikaela Shiffrin was completely another. Luckily snowmakers were able to take advantage of a late-October cold snap to blast snow up to 10 feet deep in preparation for the races. Asked about concerns for rain or the erratic weather patters that late fall in northern New England can bring, Kuehn laughed. “We give it some, the rain takes some, but we’ll give it some more when it gets cold again,” he said. You’ve read (and likely griped) about El Nino and La Nina, heard about “lake effect” and maybe even debated the existence of the legendary “Jay Cloud” (which seeks to explain why Jay Peak consistently gets the deepest powder during a snowstorm), but when it comes to getting the most out of your ski season, having the ability to create your own forecast is rivaled by none. Every year when the temperature drops, Vermont’s Alpine and Nordic ski areas combine increasingly sophisticated snowmaking and forecasting technology with some old-fashioned muscle-power to give winter the jump-start it sometimes needs. The results: whales of creamy snow and wall-to-wall coverage while the last of the fall leaves still stubbornly cling to branches in the valley floor. All that snowmaking power doesn’t just make the great days even better; when Mother Nature gets stingy, the snowguns and snowmaking ponds and the men and women that manage them are also our saving grace. At Killington, the youngest snowmakers are 18 years old (the minimum required age) and the oldest is 61. Killington’s Jon Kuehn, who is 40, said he’s still learning about Killington’s complex system that can blast air and water to six peaks – even after working there for 17 years. New snowguns, automated systems and better forecasting have vastly improved the quality and quantity of the snow produced. In the last three years, Stowe has completed a $10.5 million snowmaking expansion that included replacing the majority of on-hill snowmaking pipe, adding over 600 tower guns and 36 automated fan guns, and upgrading pumping stations. The new energy efficient guns from HKD allowed the resort to eliminate the need for eight diesel compressors and save 100,000 gallons of diesel fuel used to power them. A popular motto among snowmakers is to work smarter, not harder and resorts have found plenty of ways to make snowmakers’ jobs easier. In addition to tower-mounted snow guns, Stowe has used an automated fan gun system for 13 years. Still, snowmaking is physical work. While crews use snowmobiles, four-wheelers or chairlifts to get to the top, there’s still plenty of walking to be done. Over the course of his shift, Kuehn walks between 10 and 15 miles while dragging or carrying equipment or hoses that can weigh 30 pounds each. “Now’s the time of year when I start eating a lot of food and burning a lot of calories,” Kuehn said. Meanwhile, the work exposes snowmakers to some of the most extreme winter weather. At 20 degrees below zero, the heavy parka and pants sound like a paper bag. Snowmobiles are kept running, as they may not restart if shut off. At the summit, wind chill can drive temperatures as low as 80 degrees below zero in short bursts. Smaller ski areas are also working hard to get the trails in the best condition. Farther north along the spine of the Green Mountains, the Middlebury College Snow Bowl sits tucked into the northern flank of Worth Mountain. Home to Middlebury College’s D-1 alpine skiing team, this small ski area has just 17 trails and a snowmaking system that’s been in place since 1984. A small but dedicated staff of 12 mans this system in three eight-hour shifts everyday, meaning even general manager Peter Mackey suits up to wrangle hoses. He says the visual limitations of working at night are more tiresome than the cold. The equipment is heavy and in the dark, even experienced snowmakers can become disoriented. At night, snowmakers use what they call the “sleeve test,” wherein a snowmaker stands under the gun to see if the manmade snow freezes on their jacket, telling them how fine the snow is. Every snowmaking system is unique to its mountain and snowmakers have to know how the system behaves and be on-hand to prevent or fix any leaks or frozen lines. They also have to be literate in the kinds of snowmaking technology that the mountain uses. In 2013, Okemo Mountain made its largest investment in snowmaking in a decade; nearly $1 million in pumps, pipeline and a variety of guns from HKD to cover the majority of trails at the resort, ranging from 225 HKD SV tower guns to more mobile guns that can be dragged on sleds. All that new equipment allowed the area to go from no snow to open in just 10 days. “Operation Snowburst,” as the resort named their expansion campaign saw another boost the following year, with 100 more HKD tower guns. For 24 years prior to “Operation Snowburst,” Okemo had relied on a fleet of effective, but not as versatile HKD guns. “The downside of the older guns is they didn’t perform well at higher temperatures, so we had to wait until the technology could work above 20 degrees,” said Ray Kennedy Okemo’s snowmaking manager. Many of these guns are in fixed locations. These newer snow guns from HKD feature valves that can regulate water flow for the weather conditions, going from low-flow at high temperatures (above 32 degrees Fahrenheit) to higher flow at lower temperatures. While the older HKD guns pushed 50 CFMs (cubic feet of air per-minute), the newer guns go between 80 and 100 CFM of air. The new varieties of snow gun can produce different densities of snow, ranging from wet and heavy base-layer snow to light powder. Today, 98 percent of Okemo’s 655 skiable acres see coverage by this snowmaking system, manned by groups of about 10 snowmakers per 12-hour shift. Last winter, snowmakers at Okemo and Stowe were among those recognized as finalists in the HKD I Am a Snowmaker Award, presented in collaboration with Ski Area Management Magazine, a ski industry trade publication that annually recognizes outstanding snowmakers from across North America.